Scotland Week celebrates the best of Scottish culture. procession on the Avenue of the Americas on Saturday, April 9.
part of the NYRR Youth Running Series, will also take place and will begin at 10:15 AM. Street while youths ages 7-18 start and end at 69th Street at West Drive. from the run and raffles for prizes. annual Scotland Week gets underway. 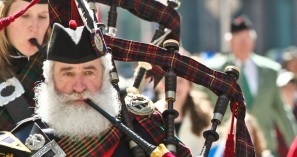 invites New Yorkers to embrace their inner Scot. bagpipers playing traditional Scottish tunes along a 6.2-mile loop in Central Park. join in the fun and participate in a 1.6-mile run through Central Park. Spectators can also partake in face painting, enjoy a DJ spinning popular tunes, and a raffle for fun prizes. Highland dancers; and many pipe bands. address those present on “Scotland Today.” A reception follows. books telling of his adventures in nature, especially in the Sierra Nevada of California, have been read by millions. host of Scottish entertainers, traditional musicians and John the Kilted Juggler. Hours: First ferry departs mainland at 8:00a.m. ; last ferry departs Ellis Island 6:45p.m. Little Fire in Concert (FREE). Hours: Doors open at 9:30p.m., show starts at 10:00p.m.Admission: $25 in advance; $30 at the door; $20 food and drink minimumFriday, April 8New York Caledonian Club Pre-Parade CeilidhJoin the New York Caledonia Club for Scottish entertainment and music, dancing, food and refreshment. Hours: 7:00p.m.Friday, April 8Laura McGhee Live at St. Andrew’sCeltic/country artist & fiddle player Laura McGhee, from Dundee, Scotland will be performing at St. Andrew’s Pub. Laura's music is a hybrid of influences from her Celtic roots to country and Americana. She recently released and EP, “How Leaving Feels,” that chronicles her journey.St. Andrew’s Pub140 W. 46th Streethttp://nyctartanweek.org/event/laura-mcghee-live-at-st-andrews/Hours: 9:00p.m.No cover chargeSaturday, April 92016 Tartan Day Parade The 18th annual Tartan Day Parade takes place on April 9 and is a highlight of the Scotland Week festivities. 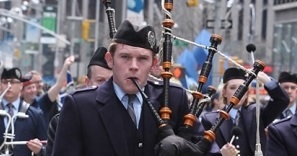 Led by Grand Marshal, Outlander's Sam Heughan, the parade will bring together pipers and drummers from all over the world in a celebration of the contribution made to the USA by the Scots.Parade begins on 6th Avenue at W 45th Street and proceeds up 6th Avenue to 55th Street http://www.americanscottishfoundation.com/tartanDay/index.htmlParade begins at 2:00p.m.